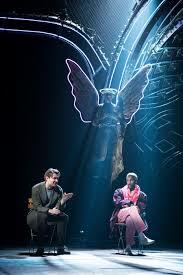 As Angels in America is a two part play, it seems only right to review it in a two part blog. The first part, detailing my emotional reaction to it, having been the ultimate in over invested (by writing an entire PhD on it) can be found here and indeed if that wasn’t enough, some thoughts on my PhD and the plays it’s on can also be found here . The play has flown home to the National, where it was staged 25 years ago (as the World Premiere in fact). And in a world where Reaganism now looks like a moderate American political approach, the world of 1985 America seems not so distant after all. Equally troublesome and relevant are the remarks on race that Belize (Nathan Stewart Jarret) makes throughout that could have been written yesterday. 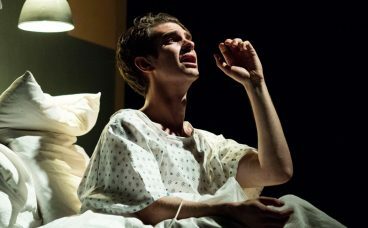 Known best as an AIDS play, we may have moved on in terms of treatment, but stigma and indeed infection rates continue, and even without the play is just as relevant as a memorial to that time, to the people we lost, as it is a warning for today. Elsewhere the commentary on homophobia- internalised and elsewhere remains sadly relevant, and Kushner’s observations on mental health through Harper seem now actually ahead of their time. Finally though, although it is the ‘Gay Fantasia’ of the title, this is a play about people, and there’s a little something of all of us in Kushner’s characters. Leading the star-filled cast is Andrew Garfield as Prior Walter. Emotionally played to the core, from up close an often-painful watch as he goes through not just the physical trials but faces Prior’s emotional challenges (and a few angels). It’s emotional, granted often loud, anguished and at times outlandish (drag can be a drag after all) but it’s always honest to the character, and serves the play not the actor. Likewise, Nathan Lane, no stranger to stealing a scene for better or worse, pitches Roy almost perfectly. The humour that was a given is delivered dead on, but there is a danger that lurks beneath that is frankly terrifying. Meanwhile Denise Gough delivers the kind of sensitive but ultimately tour de force performance as Harper as you’d expect. Never weak but still showing all the vulnerabilities of Harper, she unravels only to build her up again, and it feels like a triumphant battle won to see the change in character across the play. It’s a part in the wrong hands that could slip into irritating, certainly into weak and unsympathetic, Gough handles Harper perfectly- pitching her pain, delusion and frustration but never allowing her to be a victim. Easy to overlook alongside Andrew Garfield is James McArdle who is also giving the performance of his career as Louis. A difficult role and one that without, the actor playing Prior will really struggle. McArdle and Garfield have perfect chemistry and from their first scene convey the familiarity and conflict of their relationship. That McArdle doesn’t look the ‘traditional’ Louis that is cast-and frankly a highly attractive one- also offers a different dynamic between he and Garfield/Prior and later Joe/Tovey. Louis’ is a hard sell for an actor- he can, indeed is, fundamentally unlikable at times but he is also the most universal of the characters. There’s a little bit of Louis in all us-whether it’s the neurotic insecure side, the side that has a mouth that runs away from them or frequently a foot in it, and the side that doesn’t hold up under pressure. The darkest, most honest part of Louis is when he turns away from Prior when he gets sick, and as much as what he does is terrible, it’s also equally understandable. And that is the skill that McArdle makes that decision honest, real and awfully relatable. Equally easy to overlook amid the starry cast and emotional story lines is Susan Brown. Whose primary roles are Hannah Pitt and Ethel Rosenberg. Brown here is giving the performance of her career (and that is saying something) with a varied and challenging set of roles. Hannah, the Mormon Mother who doesn’t understand her son’s actions, and struggles with his confessions, alone in the big city, overcomes this to care for Prior when he needs her. It would be easy to slip into a caricature of an older Mother, or religious fanatic, but what she delivers is honest, at times raw and always intelligently played. Likewise, her Ethel Rosenberg, taps into the woman behind the story (or the ghost in this case) and manages to steal scenes-and laughs- from Nathan Lane. Millennium is cleverly staged but it becomes more apparent how cleverly when viewed with Perestroika. But there are three revolves on stage, with various abstract ‘rooms’ built in. At the start stage left is Prior and Louis’ area, stage right Harper and Joe’s and then as things progress these bleed- or revolve into each other. It’s a neat and clever bit of staging, if flashier than I’d instinctively choose- but there’s method in it. Added to that, out of nowhere Roy’s apartment springs up from the stage. Of course, the end of Millennium has always been about the Angel. It’s- until now always been a traditional affair in terms of the entrance of the Angel, but this being Marianne Elliot (of War Horse and Curious Incident fame for the uninitiated) the traditional means of Angel entrance and/or execution were never going to do. It would be unfair to spoil what does fulfil the ‘Very Steven Spielberg’ that Prior remarks as she approaches. But it’s different- and yes it involved puppetry, but it worked. Opening with literally the remains of Millennium around, the tone and direction of Perestroika is clearly different. And although these plays make a whole, they are separate works, and the subtlety and ultimately also clarity with which Elliot manages to treat them as separate and a whole is executed with finesse. In short Perestroika gradually strips away at the set, the play and in a manner the actors. It is not without its big set pieces- and those who don’t know just how big the Lyttleton stage is are in for a visual treat. As much as Millennium works, staging wise, on its own there are questions- it doesn’t quite seem to fit with Kushner’s desired ‘Pared down’ approach, nor is it spectacular enough to seem an utter departure. However, with Perestroika it works, because what Elliot does is gradually strip all that back until the final scene is a bare stage with the actors and the angel statue. It’s both exactly what the Brechtian Epic influences Kushner draws on are after, as well as Elliot’s own twist on it- and that’s some confidence as a director too with this massive thing. Perestroika is full of little genius nerdy touches that I loved but it’s also visually stunning despite that being ‘stripped back’ using the entire depth of the stage is a great move and gives a real chance to play with the images on stage. Despite all that going on, the theatricality it’s still the performances that carry it through, particularly in the last few scenes. Prior’s address in Heaven, when he implores the Angels ‘Bless me anyway, I want more life.’ Is some of the most beautiful writing in the play- and despite the metaphor and staging being strong in this scene it is quietly left to Garfield to deliver the real clout of the writing. It is the Epilogue however when the power is fully given over to Garfield, the set stripped bare as he deliver’s Prior’s final address. The end as ever was emotional, and as I said above, strips it all back. The writing of Angels remains as powerful as 25 years ago, and when it comes down to the scenes that really matter, Elliot is smart in staging it so that all the attention is back on the words. And it really packs a punch. 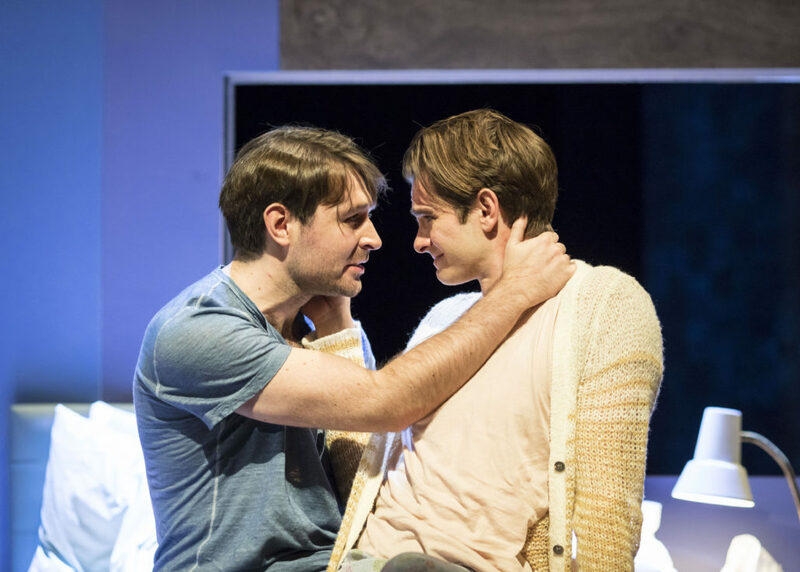 Angels in America is a wordy, challenging piece of writing and Elliot gives an audience additional elements to think about with clever thoughtful staging that challenges the play as well as the audience. It’s a play filled with themes, questions and often not answers which while unwieldy and yes-over-written at times, there is a reason this play was canonised so quickly and is revisited now. It feels fresh, it feels current and ultimately it is also an incredibly moving piece of work. Elliot’s staging dazzles, but it is Kushner’s writing and a team of emotionally charged and equally intelligent performances that have the final word. 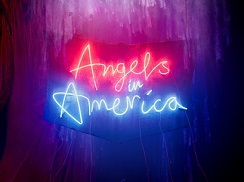 Angels in America runs until August 19th. NT Live showings nationwide and internationally from 29th July.